Ernest Rossi has been one of the great innovative thinkers of the past 50 years. He and his wife and colleague, Kathryn Rossi, have continued this work together for the past two decades. His prominence began to emerge from his work with the famous psychotherapist and clinical hypnotherapist Milton H. Erickson. Their 8 years of work together in the 1970s produced a set of books and papers that have become seminal volumes in the field of mental health and recovery. Rossi’s books after Erickson’s death have sought to engage our understanding of being human at the cutting edge of science. He was writing about the relevance of gene expression to the practices of psychotherapy and hypnotherapy in the 1990s. Over the past decade the inclusion of quantum physics in his books and lectures has been a steadily developing theme. In his introduction to this series, however, we can see that these ideas entered his thinking long before. We have a lot to do to catch up. 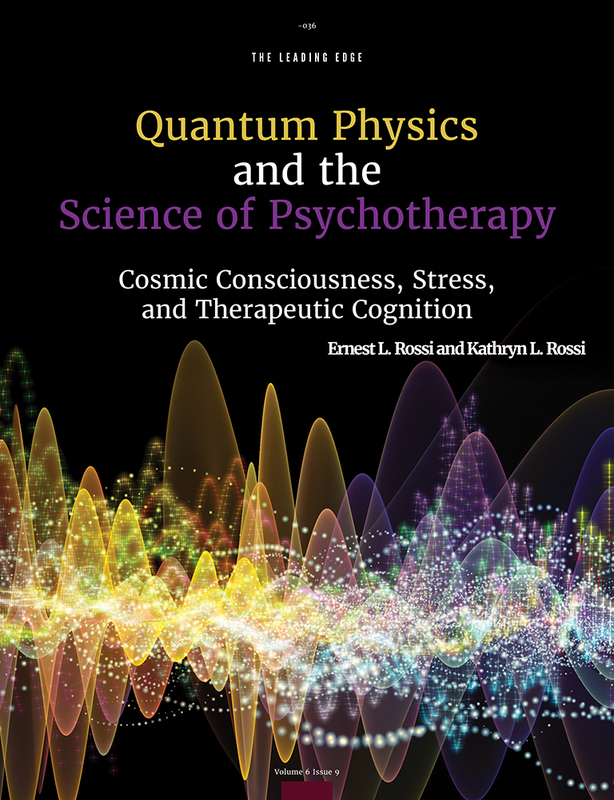 In this article, the first in a series that the Rossi’s are writing especially for The Neuropsychotherapist, they review the evolving perspectives of subatomic particle physics, math, biology, and psychology that we have witnessed over the past century, as they seek to create a new integrated quantum field theory of cosmos, life, stress, and creating a new consciousness. Rossi engages us in his wonderings as he seeks answers to questions such as: Why quantum? Why symmetry? Why chirality? Why stress? Why conflict? Why war? And why does the mirroring hands psychotherapeutic technique enable people to engage with these questions, both explicitly and implicitly? Children are naturally curious about their life experiences and learn to play with them in their imagination. Does quantum physics provide a new perspective for the general public as well as serious students of science and natural philosophy that ranges from ancient times to the modern meandering mind of discovery and self-creation? I, for one, am eager to read how the Rossi’s address this curiosity. It is with great pleasure that I introduce this series on the quantum dynamics of psychology, therapeutic consciousness, and cognition for The Neuropsychotherapist. I was a shoeshine boy about 11 or 12 years old when I first noticed a small public library where I stumbled upon a strange, dusty old book titled Cosmic Consciousness: A Study in the Evolution of the Human Mind by Dr. Richard Maurice Bucke (1901) who was formerly the medical superintendent of the asylum for the insane in London, Ontario, Canada. Bucke believed that the insane were heroic pioneers of humanity who failed in their life struggle for higher consciousness. Those pioneers who succeeded in this quest were the storied heroes of human cultures in the spiritual, scientific, humanistic and poetic domains (e.g., Buddha, Dante, Walt Whitman, Francis Bacon, Henry Thoreau) who had experienced “cosmic consciousness”. Bucke presented brief vignettes of their lives and recommended that everyone study the creative breakout moments of these cultural leaders. Many years later I was entranced to learn that this book was written in the same historic period when many Nobel prize-winning physicists and mathematicians—Albert Einstein, Max Planck, Erwin Schrödinger, Niels Bohr, Werner Heisenberg, Paul Dirac, and others—were introducing the quantum revolution in science, with profound implications for all the arts and humanities, the psychological evolution of the self-observing mind, therapeutic consciousness, and cognition itself. To make Rossi’s seven-step scale useful in an experimental context, we expanded it to nine steps by breaking down his seventh category into more finely graded steps. Our seventh category was devoted to the emergence of multiple perspectives in the dream—in particular, the emergence of the awareness of bizarreness by the dream ego within the dream. Category eight was concerned with the appearance of control over the content of the dream by the dream ego, and category nine concerned the emergence of lucid dreaming, an awareness of dreaming while dreaming by the dream ego. The other categories of our self-reflectiveness scale were left as Rossi had developed them. The resulting scale is presented in Table 1. Dreamer undergoes a transformation of body, role, age, emotion, etc. These researchers found an unusual distribution of scores about self-observation in dreams, illustrated in Figure 1. In the typical distribution of scores measuring such psychological experiences one would expect to see a normal bell-shaped curve rather than the jagged-edged tooth, diffraction-like pattern found. What could account for this quantum-like pattern that is highly characteristic of the double-slit experiment on the quantum physics of light? Two different explanations have been offered by scientific observers. One explanation, based on classical statistical theory, suggested that Rossi’s original seven stages of self-reflection might simply be placed in the wrong order. 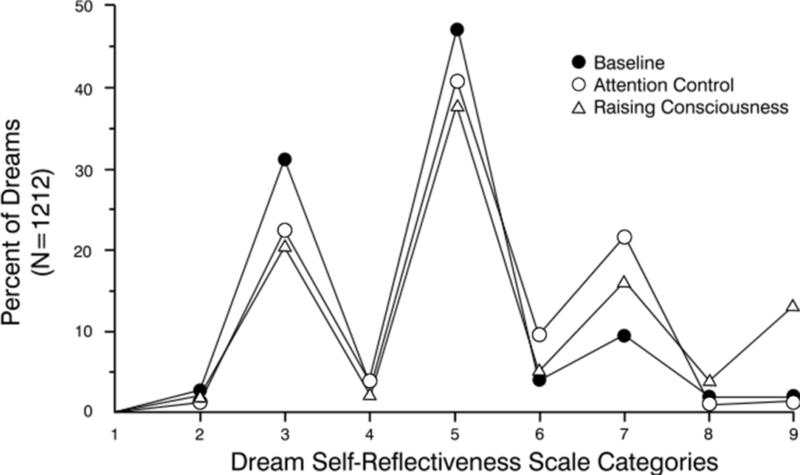 Alan Moffitt (personal communication, 1997) proposed another approach to “correct and normalize” the unexpected dips in stages 4, 6 and 8, based on the way the stages were originally defined by Rossi. While this post hoc explanation seems plausible, it involves second-guessing the original hypotheses upon which Rossi’s self-reflectiveness scale was based, the way the research was conducted, and the data found. What if we had the scientific courage to take the honest data of Figure 1 at face value and accept that it represents the objective facts? Rather than try to bend these facts to match the expectation of what a normal statistical distribution of scores should look like, what kind of a new theory would we have to construct to provide a more fitting context for these facts? Figure 1. The interference pattern of the Dream Self-Reflectiveness Scale categories: the actual distribution of dream (%) scores in college students across the nine categories of self-reflectiveness. Note the similarity of this distribution of scores to the interference pattern of quantum physics introduced in Figure 2. From “Waking, Dreaming, and Self-Regulation” by S. Purcell, A. Moffitt, and R. Hoffmann, 1993. In A. Moffitt, M. Kramer, & R. Hoffmann (Eds. ), The Functions of Dreaming (p. 228). Copyright 1993 by SUNY Press.